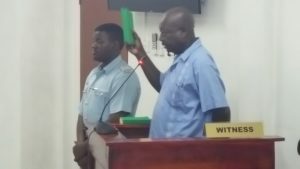 Retired Guyana Police Force Detective Sergeant, Clemsford Burnette on Thursday testified spotting a pile of burnt human remains and important documents at Lindo Creek, Upper Berbice River in June 2008. “On checking, I found there were human remains. There were skeleton bones, parts of skull and a kind of flesh that wasn’t burnt properly,” he said under questioning by the Commission’s lawyer, Patrice Henry. At the first public hearing before the one-man Commission of Inquiry being presided over by Retired Justice Donald Trotman, the former policeman recalled being instructed by his superior officers to join a party of police and soldiers to go to Lindo Creek. There, he said he saw two mining camps a short distance from a dredge. At one of the camps, surrounded by trees, he said there was a pile of burnt human remains about one foot high and eight feet wide. Also found at the scene, according to Burnette, were one 7.62 live round and four 7.62 x 39 mm spent shells, one sledge hammer, one Scotiabank bank card, one birth certificate bearing the name Barry Lloyd Patrick Harry, a burnt passport whose details could not have been recognised, and a national identification card. The Detective Sergeant said he later accompanied Trinidadian and Jamaican teams of experts. Among the things, he said, the Jamaican team had found was a wedding band. Autopsies, he said, were conducted in the absence if relatives, and he could not say if they had been notified. Questioned by Commissioner Trotman, Burnette said it was usual for relatives to be informed about autopsies but in that case he could not say whether any of them had been told. At that time, Senior Superintendent Reid was in charge. After the bodies had been taken to Lyken Funeral Parlour, he said he reported to his superior then Senior Superintendent Edgar Thomas. The Lindo Creek inquiry is the first in a series of such probes that is planned into various massacres and extra-judicial killings during the 2002-2009 period that President David Granger has described as the “troubles”.